September 13, 2017 – On September 15, 2017, NASA’s Cassini spacecraft will begin its fiery plummet into Saturn’s atmosphere after orbiting the giant ringed planet for 13 years. Now, you can relive Cassini’s historic mission with a new NOAA visualization technology that brings you along for the ride. 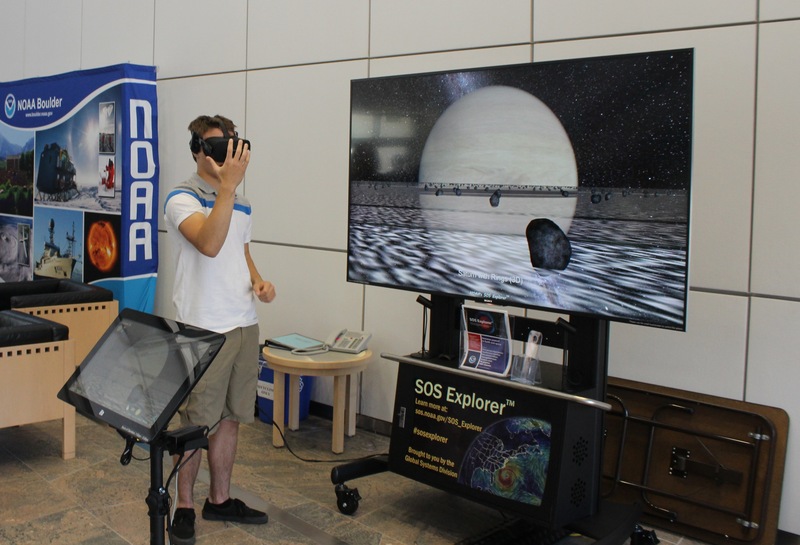 Two years after the debut of Science On a Sphere Explorer (SOSx), NOAA’s design team has adapted gaming technology to incorporate Oculus Rift virtual reality goggles into SOSx. The goggles put you in orbit around Saturn, flying along with Cassini as ice and rock particles, large boulders and moonlets float by the doomed spacecraft. Thirty seven million people each year experience NOAA’s Science On a Sphere, which was created as a revolutionary way of displaying the dynamics of Earth’s weather, climate, atmospheric processes and more. The original SOS is a room-sized, global visualization system that uses computers and video projectors to display planetary data onto a six foot diameter sphere at 149 science centers around the world. But teachers wanted to know how they could adapt the giant animated globe for their classrooms. NOAA’s answer is SOS Explorer, a compact and portable global display system designed for schools and small science centers. A free version, SOSx Lite, can be downloaded onto your home computer. 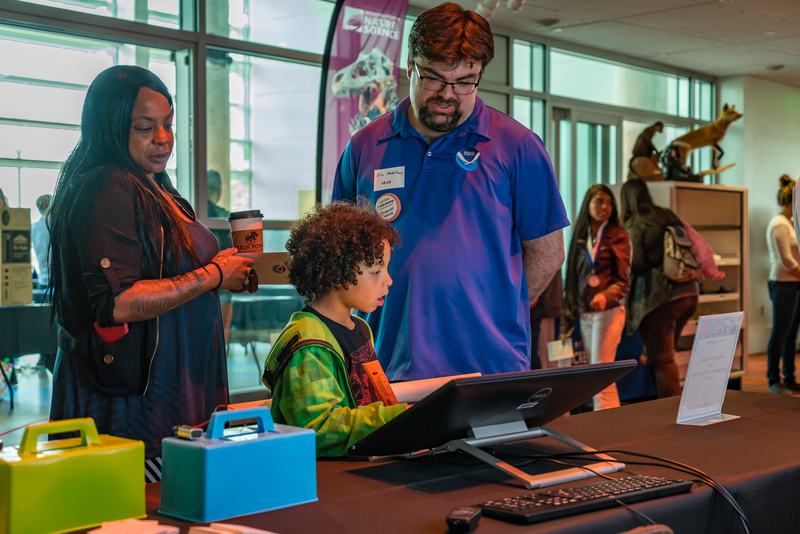 SOS Explorer engages and educates through more than 145 compellingly detailed, scientifically accurate planetary visualizations that can be displayed on a large television or projection screen. Users can pick datasets, spin the globe in all directions, and toggle between different views either with virtual fingers, a keyboard and mouse, or a touchscreen kiosk. “This is something that can enhance what we are already doing, truly,” said Amy Criswell, 3rd-grade teacher at the Dawson School in Boulder, Colorado. Now, with the new Oculus Rift virtual reality goggles, virtual representations of hands allow the user to interact with the data, navigate around the globe, or pull back to view the planet from thousands of miles up in space. 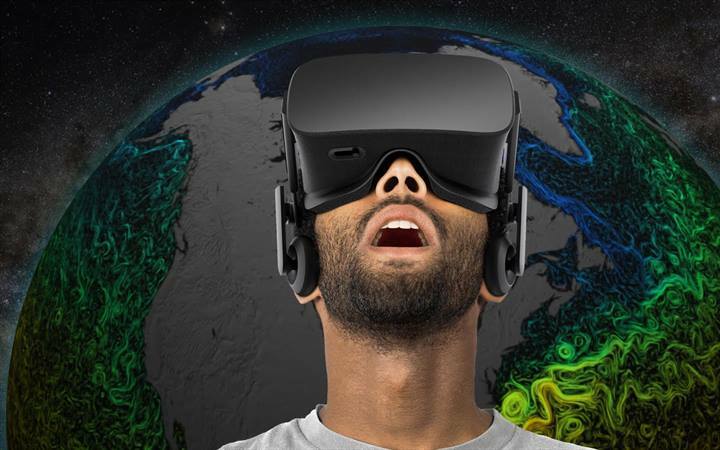 The virtual reality software upgrade, released this summer, supports most of the 145 SOSx datasets, including the rings of Saturn, the Aurora Borealis, Earth-orbiting satellites and space trash. The goggles add about $500 to the purchase price for SOSx, which can vary based on configuration. With this type of resource at their fingertips, complex datasets and scientific concepts can be displayed as high-impact presentations. For example, instead of talking about the Aurora Borealis and showing pictures, students can explore a 3D rendering of the phenomena as it might look from the International Space Station. The SOSx software upgrade also improves the “Tour Builder” feature, a complimentary application that helps users customize tours with enhanced touch sensitivity and provides foreign language support to appeal to the international community. Tours can include text, guiding questions, pop-up web content, videos, pictures/diagrams, and clickable placemarks. SOSx is available from NOAA’s Earth System Research Laboratory’s Global Systems Division and can be experienced at the Gateway to NOAA exhibit in Silver Spring, Maryland and NOAA’s David Skaggs Research Center in Boulder, Colorado, as well as at the Columbia River Maritime Museum in Astoria, Oregon; the Nurture Nature Center in Easton, Pennsylvania; the EcoExploratorio in Puerto Rico; and the Mote Marine Laboratory in Sarasota, Florida. Visit the SOS Explorer website or email sos.explorer@noaa.gov for more details.